Anderson & Kreiger has partnered with the Conservation Law Foundation’s Legal Food Hub on several pro bono matters to support the survival and growth of small-scale agriculture in the Commonwealth. 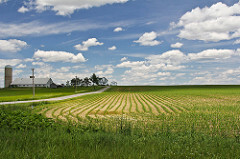 A&K attorneys Art Kreiger, Mina Makarious, Jessica Wall, Allie Mitropoulos, Andrew Fowler, and Christina Marshall have all helped farmers protect their access to farmland, address issues with tenant misuse of their property, and expand agricultural programs serving New England. A&K is proud to bring its municipal, environmental, real estate and litigation expertise to help New England farmers keep their land in agricultural production and continue to provide local food to our communities.